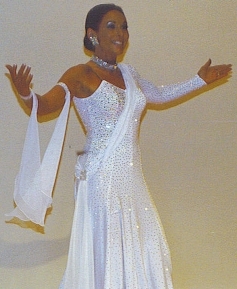 Check out this elegant Latin Costume! Black/red lace heavily stoned with Swarovski stones. Rolling layers of skirt in red to show off your dance movements. Comes with detachable belt, necklace and two bracelets. Size small. Practically new. Worn once for 5 minute show Rumba. Call Susie at 585-503-7087 or Susiebballroom@gmail.com for more information. One of the many costumes Susie is selling currently is this beautiful Chrisanne Ballgown. A nice stretchy fabric, covered with exquisite top quality Swarvoski rhinestones and adorned with dyed ostrich feathers. This is a small size dress. Don’t wait if you are interested, because it won’t be around long! Call for information today! 585-503-7087. So, you are learning how to ballroom dance. You can now complete your look with a beautiful dance costume. Susie Buck has the means of suiting you up so you look like those beautiful dancers on “Dancing with the Stars”. Susie used to work for several top costume designers in the United States. She can help design a beautiful new gown for the ladies or sleek new tailsuit, dance trousers and dance shirt for the men. Remember, what you wear is the finishing touch to a perfect look for the dance floor. Talk to her today about finding that perfect costume for your next show or competition! Check out some of the pictures of past costumes! This will give you an idea of some of the many possibilities of beautiful designs we can create just for you. Contact Susie for more information about a custom made dress or tailsuit today, or a “gently worn resale”!